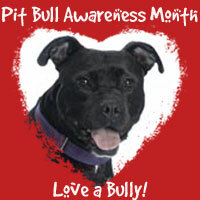 It's national Pit Bull Awareness month! If you've been thinking about adding a Pit Bull dog to your family, we'd like to suggest that you check out your local animal shelter. Browse Petfinder, Petango or another of the online adopt a dog sites. Or, better yet, find a Pit Bull rescue group in your area. There you'll find dogs who have been checked for socialization, vetted and vaccinated, and often living in foster homes so that you'll know that much more about your wannabe best friend. Though they do not necessarily list every single Pit Bull dog rescue, since new ones are organizated frequently, we suggest you fetch BULL911 for a substantial list of Pit Bull rescues from across the country. From Alabama to Washington and parts in between, you'll find many rescues that are eager to help you in your adoption quest. BULL911 is an American Pitbulls advocacy site operated by a group of bullie loving dog owners, fans, trainers and friends who are working hard to save Pit Bulls. I had no idea there was a registry of pit bull rescues, what a great idea!! It would be great if there was a registry of all rescues, wouldn't it? That way no matter what type of dog you wanted to rescue, you could find someone close by! I had no idea there was a pit bull rescue registry. It would be great if there was just one registry for all rescues, sometimes I think people don't rescue because they aren't aware of it.